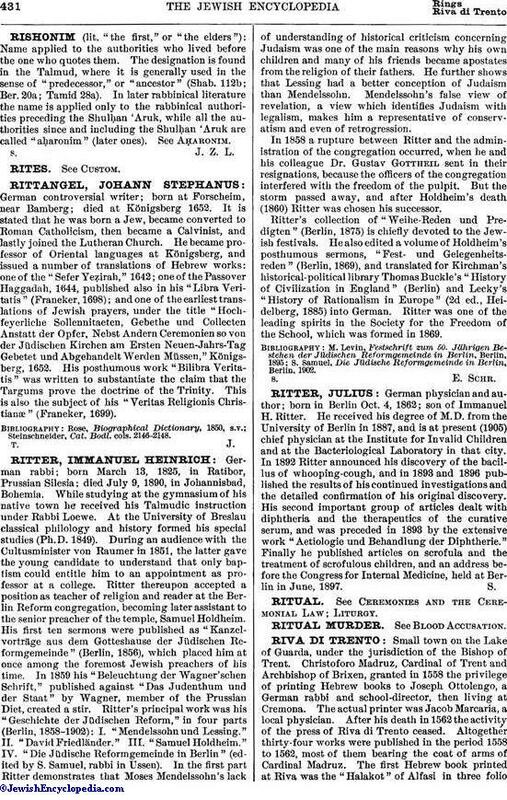 German physician and author; born in Berlin Oct. 4, 1862; son of Immanuel H. Ritter. He received his degree of M. D. from the University of Berlin in 1887, and is at present (1905) chief physician at the Institute for Invalid Children and at the Bacteriological Laboratory in that city. In 1892 Ritter announced his discovery of the bacillus of whooping-cough, and in 1893 and 1896 published the results of his continued investigations and the detailed confirmation of his original discovery. His second important group of articles dealt with diphtheria and the therapeutics of the curative serum, and was preceded in 1893 by the extensive work "Aetiologie und Behandlung der Diphtherie." Finally he published articles on scrofula and the treatment of scrofulous children, and an address before the Congress for Internal Medicine, held at Berlin in June, 1897.